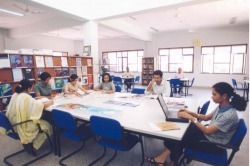 School Library, an attractive, well-resourced area offering a wide range of information under the full-time supervision of a team of librarians. The comprehensive stock of books, CD ROMs, cassettes and CDs, together with a network of PCs, meets not only the academic needs of pupils, but also encourages their leisure reading and listening. Departmental libraries for art, classics, geography, history, mathematics, and music, most of them situated close to the department’s schoolrooms. They have stock which is more specialized and aimed mainly at older boys. Jubilee has twenty-four science laboratories, housed in the science building in Queen’s Schools. The original Victorian building was substantially extended in the 1960’s and again in the 1980’s, with a smaller extension to the top floor in 2000. The ground floor houses the eight laboratories of the chemistry department, along with a 165-seat lecture theatre (the Egerton Room), which is used for the Scientific Society and other meetings. On the first floor there is the physics department with its eight laboratories, and the two new computer rooms. The top floor houses eight biology labs, the newest of which was opened in 2000. In addition, each of the science departments has well-stocked preparation rooms, and smaller rooms with particular functions, such as microbiology, darkrooms for optics experiments, and a well-equipped analytical instruments room for chemistry. Almost all science masters have their own schoolrooms, which combine a desk area for class teaching, and bench space for practical work. The bench areas have a full range of services fed from flexible overhead or floor-level service points. This arrangement allows great flexibility both in terms of room layout, and in use of time, with the transition between practical and theoretical activity able to be made very quickly. Safety is a major concern in modern science teaching. All our staff have received appropriate safety training, and a wide range of safety-related equipment, such as fume cupboards (two in fixed cupboards in each chemistry lab plus a number of portable cupboards), is in use. The science laboratories are serviced by a team of twelve well-qualified technicians and a budget which allows us to purchase the latest equipment. 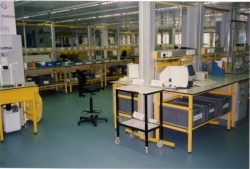 All the science laboratories are equipped with data projectors and a networked computer for easy use of IT, including Internet access and electronic data logging, and miniature TV cameras for the viewing and capture of images from smaller experiments, microscopy etc.